Foremost Niger Delta leader, Godknows Boladei Igali, former Nigerian Ambassador to the Scandanavian - recently jumped out of his convoy to get out of a two hour traffic jam on the East West road in Bayelsa state. 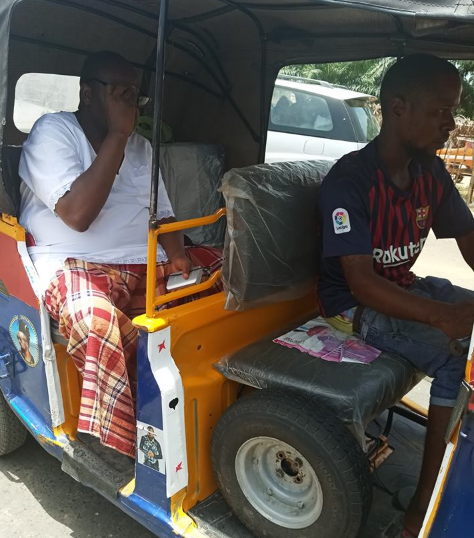 The diplomat boarded a tricycle popularly known as Keke Napep to enable him meet up to the 2019 Tompolo Birthday Lecture in Warri, Delta State. According to his aides, Ambassador Igali who is Chairman of the occasion kept insisting that he cannot keep people waiting. From Zarama area, the governorship aspirant headed to Kaiama on the Keke to catch a public transport to Warri.